Michael O'Neill will freshen up his Northern Ireland side in Tuesday's friendly against Israel, live on Sky Sports, but said he is not in a position to make wholesale changes. 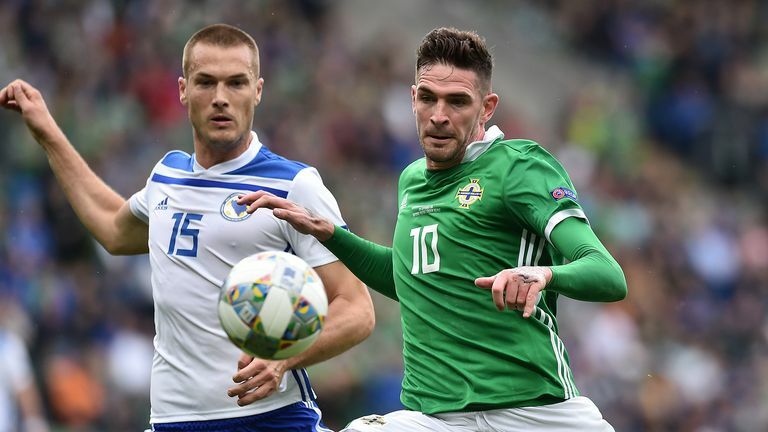 Northern Ireland are looking to bounce back from the disappointment of Saturday's 2-1 home loss to Bosnia & Herzegovina in the UEFA Nations League - a game in which they dominated but were hit by two sloppy goals. O'Neill said: "It gives me an opportunity to look at some aspects of it. But we were not in a position where we can just change nine players. "To do that we'd need to ask players to play out of position, and when you bring players in you want to give them the best chance to do well, so it is important to put them into a team which is cohesive and as strong as possible. "There will be changes but it is not just a case of starting the players who did not play on Saturday." Leeds goalkeeper Bailey Peacock-Farrell made his first competitive appearance at the weekend but found himself in the spotlight for the wrong reasons with Bosnia's second goal the result of a horrible mix-up with Craig Cathcart. O'Neill declined to say who would start on Tuesday, but said the decision would not be based on Saturday's game. "It's important that the lads get minutes," he said. "If I do make a change it will not be related to performance. "Trevor (Carson) has been playing for Motherwell and Michael (McGovern) played in the cup for Norwich so I think the goalkeepers are strong. "It was good for me to get Bailey on the pitch. He will be disappointed with the nature of the second goal but one thing I've noticed is he's already left it behind. He's not the type of guy who is going to dwell on things. "He's in a position at his club where I imagine he's being pushed every day and that's good for us. "Any changes that are made will not be a reflection on performance but just on giving a bit of freshness to the team." Kyle Lafferty, who started on Saturday but took a knock, did not train on Monday morning, but O'Neill said the Rangers forward was simply being rested.